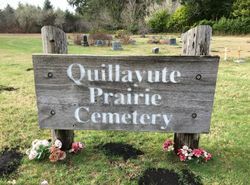 This site is a Quillayute Tribal Cemetery. Clallam County Genealogy Society has two lists of burials. One list has 99 burials from 1905 to 1983. This list is alphabetic, with dates and some burial lot locations. Arthur J. Munson provided the first list. A 2010 list has 9 burials from 2007 to 2009. FindaGrave has an updated list totaling 186 buriels with photos.